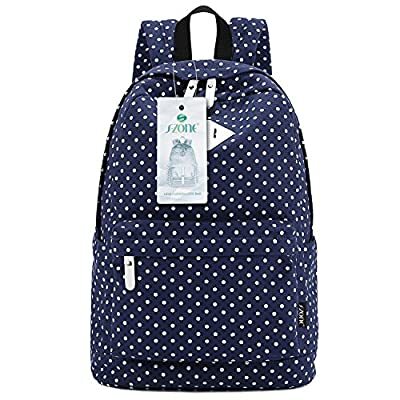 The backpack is made of high-grade durable material, simple but in style design. Perfect match of component parts make the backpack look more elegant and fashionable. Scientific and reasonable pocket and lining design will let your goods lay in the bag in an orderly way. External front pocket can put iPad, iPhone, Bus Card or other small items. Easy style using for: school, hiking, camping, shopping, overnight stay etc. Material: High quality canvas fabric, dot ptinting, thicken cotton paded and adjustable shoulder strape. Dimensions:45 x 33 x 16cm, 13 x 17.7 x 6.3 inch(L x H x W), can held 14 inch laptop easily (but tight for 15 inch laptop), macbook pro, ipad, netbook or other electronic products. Application: Can be used as girls bags, canvas backpack, school bags, weekend bag, travel bag, hiking rucksack and so on. 1x main pocket, 1x front pocket, 2x side pocket, 2x small inner pocket, External front pocket can put iPad, iPhone, Bus Card or other small items. Easy style using for: school, hiking, camping, shopping, overnight stay etc.